Any High mileage XF owners? I'm seriously thinking of a 3.0d XF as my next car, probably a 2012 - 2013 model. I have done some research and I can only really find the turbo intercooler weld splitting being an issue with the engine, anyone know if the intercooler is the same for the 237bhp and the 275bhp models? 100,000 mls - 3.0 d 275 bhp. Uneven tyre wear from wheel scrubbing. Replaced front wishbones which helped but still not right and will need to do track end rods too by the looks of it. Also had failure of pulley on serpentine belt. FULL notification come up for 6,000 miles and my driving habits have not changed . Did have a scuffing on the inside of both front tyres but this was due to the tracking being out and with the state of our roads now I will get it checked more often. I love the car and enjoy driving it and gives good performance. Thanks for the replies, have either of you had the fluid changed in your gearboxes, I don't know if that is part of the jaguar service schedule? I would recommend getting the wheel geometry done as a lot of the tracking systems get the wheels point straight forward but not at the angle so the tyres still wear incorrectly. My 3.0d is recent purchase and at 87'000 not super high miles by the looks of the above but I had to replace all the discs and pads within a week of getting it. The specialist I went to said that XF's eat brake pads but are largely very good to own, he said the 3.0 has a great engine one of the best Jaguar have ever made. He also does land rover/range rover and says they form the core of his work as they always go wrong - as a previous Discovery owner I would very much agree with that and would never get another! I love driving my XF that 3.0 coupled with the 8 speed seamless gear change means you pick up speed ridiculously quickly - its a feel good car. That said if i am gentle with it I can get 45-50mpg on a decent run which is about the same as my BMW 320d. Mine is Black and the paint is nice looking when washed but dirty within a day the paint on mine seems unusually jaded even though its a young car so I am investing in a machine polisher and am going to work on it slowly over the summer cutting it, polishing it and sealing it a bit at a time - then i'll do the wheels then polish and water treatment on the glass too and then it will be perfect! My only warning would be that if you do a lot of short journeys get the petrol not a diesel as the DPF will get sooted up on short runs which is a potential problem. PG63: That's amazing and encouraging that you have done 150000 miles with so little problems. TJM: I have a 90 mile commute on mostly A roads so DPF shouldn't be an issue. 145000 miles and counting, owned my XF since new (Decmeber 2012), full service history to date. Only issue I've had was/is near side wheel bearing failure (twice), although my battery needs replacing due to random electrical issues. My 59-plate 3.0 litre diesel XF is now at 206,000 miles. I have taken the precaution of getting the transmission fluid and filter changed. Only issues have been electrical / software niggles which come and go by themselves and a rusting rear subframe. Still doesn't burn any oil. Original shock absorbers still giving a good ride and 40 mph in easy reach on the longer runs. Mine is a 61 plate 3.0 litre diesel XF on 78,000 miles (bought it at 28,000 miles 4 years ago for £14,000.00). Fabulous car to drive and in my ownership main jaguar dealership servicing annually. At last service told that there was a slight oil leak suspected from the nearside turbo but wanted £480.00 to investigate. I left it as the car runs beautifully. A few days ago I had a strong 'burning' smell in the cabin when stopped in traffic and a good deal of light smoke emerging from the nearside edge of the bonnet. Oil level has dropped so the burning is the very expensive (£80.00 per fill) oil. 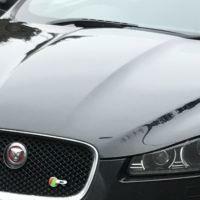 It seems to me that the big problem with Jaguar cars is repair cost and I do wonder at build quality. In my view main dealers will almost always want to replace components (I would respectfully call fitters) rather than repair defective parts of otherwise good components (mechanics). My car is worth around £4800.00 according to valuation sites. I am told that the cost of a replacement 'minor' turbo unit (I gather there are two on the XF 3.0 diesel) would be £2700.00 if done by a main dealer. Not sure if that includes VAT. Its seems that I now have a 'scrapper'!